Two days after former news executive Paul Steinle retired last summer, he hitched a 31-foot mobile home to his champagne Silverado pickup to discover first-hand if newspapers have what it takes to succeed in the digital age. Now that he has visited at least one paper in each of 37 states – with stops scheduled in the rest by July – the preliminary verdict is in. But not every paper will make the transition from the near-monopolistic print model to the vastly more competitive digital space, said Steinle, a broadcast journalist who led United Press International in its ebbing days and then became associate provost at Southern Oregon University, where he worked until he retired. Still, he is optimistic. 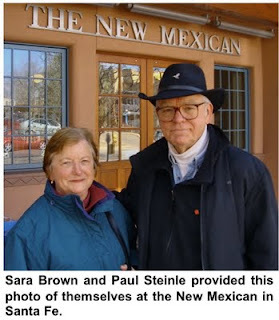 “I have been in a number of business turnarounds in my career and I don’t see newspapers as buggy whips,” said Steinle, whose partner on the quest to save the press is his wife, Sara Brown, a former human resources executive at the Los Angeles Times and The Columbian in Vancouver, WA. Steinle reports his wife is as optimistic as he is. Watching the horrifying tumble in publishing revenues and readership after 2005, Steinle and Brown decided in 2009 to do something more than hope newspapers would have a future. As Steinle’s retirement approached, the couple founded a non-profit organization called Valid Sources to identify and share “models of excellence” in publishing, as well as to make the case that newspapers matter to the civic health of individual communities and the nation as a whole. Undaunted when they could not find philanthropic support for their mission, the couple decided to hit the road on their own nickel to identify best practices in newspapers across the land. Ten months, 23,000 miles, only 10 miles to the gallon and more than $30,000 in out-of-pocket expenses later, they have posted video interviews with key leaders at one newspaper in each of 25 states. Additional reports are scheduled for publication through the fall. Steinle said he selected what he called “transformational” publications that view themselves as multimedia, multi-platform news and information services. The first stop was the Sequoyah County Times in Sallisaw, OK, a 5,000-circulation, family-owned weekly, that – like its big-city brethren – is leveraging technology to provide more and better coverage with less expense. Other stops included the Anchorage Daily News, the Baltimore Afro-American and the Charleston (SC) Post and Courier. Based on the enthusiasm and passion he found at every stop, Steinle says it would be a mistake to write off newspapers. “Just because digital comes around doesn’t mean the usefulness of the newspaper ends,” he said, citing the portability, ease of access, low cost and serendipity that you get when reading the news in print. Most important of all, said Steinle, is that newspapers are the No. 1 source for local coverage. What a great story. Ia m following this one for sure. He makes a great point. Who will tell the local stories? I would argue that a collection of local bloggers might but maybe that could be the role of the new local paper, gathering those writers. It would be interesting to see local newspapers move into more of a "curator" role, vetting and sourcing information and stories from local bloggers, twitterati and Facebook, essentially providing a human-powered version of Flipbook(iPad). I could see that having immense value. As information grows exponetially online, we will inevitably need curators choosing and delivering our content to us- essentially the role the newspapers currently play and have for ages. Very interesting story, and he brings up a lot of great points about both the challenges newspapers are facing and the value they bring to society. Newspapers are making great efforts to adapt to the changing landscape; from trying to monetize digital space, creating apps, integrating daily deal models and trying other ways to sell print advertising space. It's good to hear a positive take on what's happening at publications throughout the US. Great story, great post, Alan....one questionL why did you write NICKEL instead oN THEIR OWN DIME, rhymes with TIME....re "the couple decided to hit the road on their own nickel to identify best practices in newspapers across the land. " He's got it right! I have thought of doing something similar...a very worthwhile effort. Thanks. I'd contribute a few bucks to this project. Gasoline isn't getting any cheaper. Good to see somebody point out the enthusiasm, creativity and knowledge rampant in newspaper offices. Where the corporate officers and stockholders haven't sucked the spirit out of the employees, great things are being done. Great article. So nice to see a positive spin on newspapers for once. Paper erects pay wall – and traffic goes up! Will classified advertising come back? Facebook comments: Friend or foe for pubs?